Earn 512 loyalty points when you order this item. The Custom Design Milan Reference 10 Acoustic Hi-Fi 2 has been introduced by Custom Design following an exercise in evaluating and employing their customer's feedback and suggestions. 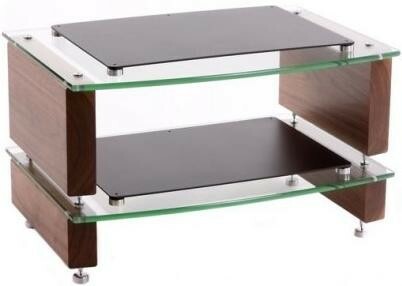 As consumer's perceptions of Hi-Fi furniture are changing, it has become clear that design has come to the forefront of their desires; they want contemporary design rather than something that is simply an accessory, and this has, in some circumstances, become more important than performance. Consequently the New Milan Reference 10 Acoustic Hi-Fi 2 has been designed primarily as a piece of furniture; the wood finishes are elegant and impressive, and there are six to choose from. 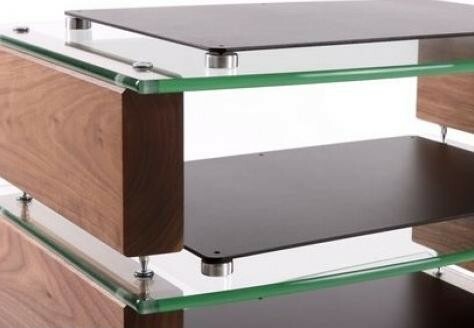 Behind the glamour, however, there lies a piece of acoustically enhanced audio furniture which references Custom Design's 24 years of experience and knowledge to bring the highest standards of audio enhancement to a piece of stunning craftsmanship, which will compliment any household's decoration. The Acoustic design differs from the standard Milan Reference 10 in that the glass shelves are all reinforced with iRAPs, or Isolation Resonance Absorption Platforms. This adds an additional layer of dampening and, combined with the solid hardwood supports, eliminates the natural frequencies that can occur through the support. Improvements are specific to the dynamics, and add depth and clarity to the bass response. The Milan Reference 10 Acoustic Hi-Fi Furniture Range is manufactured from solid oak, walnut and ash hardwoods. 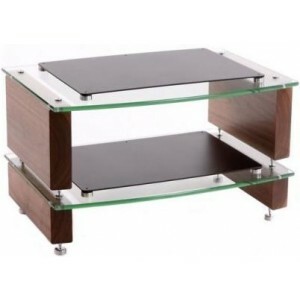 The 10mm glass shelves are toughened with polished edges and available in clear or black finishes. The hardwood and glass shelves can support 50kg per shelf and a discrete radius front edge provides the Milan Reference 10 Hi-Fi Range with another distinctive design feature. 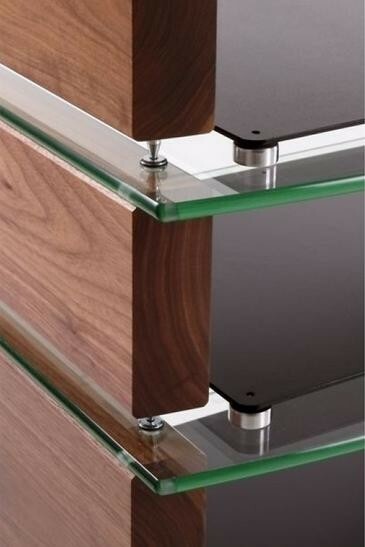 The modular design enables the addition of extra shelving as and when your Hi-Fi system matures and expands.